Augmented and virtual reality are technologies of our time and seem to be expanding at an ever increasing pace. I wanted to look back at where the origins of these technologies have come from and the initial inventions and developments that spawned these new platforms. For the origins of AR and VR Morton Helig is often credited. through his construction of the Sensorama machine starting in 1957. This was designed as a cinematic experience which tried to immerse all your senses. It delivered different images to each eye, played sound at you and even vibrated your chair and blew air at you. So this was a really immersive solution and functionality it has more sensory inputs than we have with todays augmented and virtual reality solutions. The first film created was a 10 minute motorbike ride through New York. Unfortunately this machine was commercial unviable partly because it is the size of an arcade machine and partly because it cost to much to make the films for. 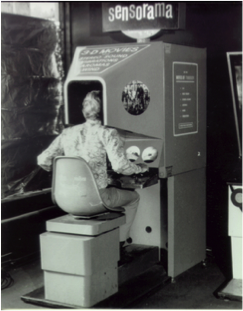 But this one machine shows some of the early ideas that have become Virtual and Augmented reality.